Home » » SARS murdered my innocent husband, labelled him cultist –Wife of late taxi driver. SARS murdered my innocent husband, labelled him cultist –Wife of late taxi driver. The widow of a taxi driver that was allegedly shot dead by Special Anti-Robbery Squad in Rivers State, Mrs. Gift Ademisoye, has cried out that security operatives killed her husband while he was returning from where he went to eat amala and ewedu soup. SARS operatives, an outfit of the State Police Command, had on Monday allegedly shot and killed 42-year-old man, Jibade Ademisoye, close to his house in Rumuakunde community, Emohua Local Government Area of the state and labelled him a cultist. The security operatives had claimed that cultists in Rumuakunde had opened fire on the security operatives, who were in the area for operation, adding that the victim was gunned down when the SARS men repelled the attack. But the widow of the victim on Wednesday told Southern City News that her husband was never a cultist and was not with any group of persons before SARS operatives murdered him, adding that his husband, Jibade Ademisoye, was only a taxi driver and a devout Christian. She added that the security operatives intimidated his husband and killed him without any reason as she called on the governor of Rivers State, Chief Nyesom Wike, relevant agencies and well-meaning Nigerians to intervene and fish out the culprits. The widow narrated that her husband had gone out to a Yoruba restaurant to eat ewedu Soup, his favourite meal, and was returning home after having his fill before a group of SARS operatives met and killed him. Mrs. Ademisoye said, “My husband’s name is Jibade Ademisoye. He hailed from Obosine in Ilesha, Osun State. I have three children for him. We have lived in Emohua community for about seven years now. “He was 42 years. On Monday morning, he gave me money to register our daughter in the school before he went out. When he was coming back from where he went to eat in a restaurant, SARS men met him and killed him. “They first shot him, he fell. They met him on the ground there and shot him more than two times. They dragged his dead body to a nearby bush and dropped it. They used coconut frond to cover the body, not knowing that a woman was watching them. “After they left, the woman rushed out and started shouting that they have killed Papa Sewo. Some people came out and carried him. By that time, he was still breathing. They carried him to where they will bring out the bullets, but he died before they got there. They killed my innocent husband and said he was a cultist. “My husband that told me that he was coming did not return again. The only thing I saw after was his dead body. SARS people have made me a widow. How do I train and take care of our three children. “The people that were with him before the incident saw them. 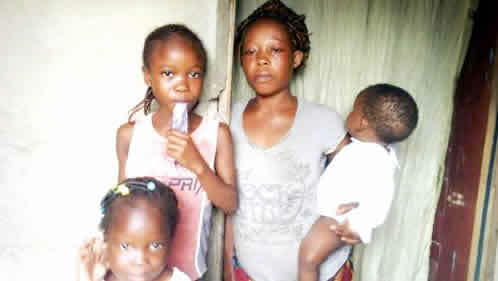 I even saw the SARS officials along the road when I was coming back from the school where I went to register our daughter; I never knew that they had already killed my husband,” the widow further lamented. She noted that the killing of her husband triggered protest in the entire Emohua clan, adding that his husband loved and treated everybody with respect and concern.